The Gajanana fund raising campaign to protect wild elephants. Send your blessings to the elephants! For the past eleven years eCoexist has been promoting the use of natural materials in the celebration of Ganesh Chaturthi – to help reduce pollution of waters with chemical substances. The intention behind our work is to reconnect Indian festivals to their origins in Nature and to sensitise people to the impact their celebration has on the natural environment. We have been creating eco-friendly idols made from natural clay, painted with turmeric, geroo and multani mitti. When the Ganesh idols are immersed in natural water bodies, they cause water pollution if they are made of chemical substances. Traditionally these idols were sculpted out of earth and kept the water pure. The idols we create can be immersed in a bucket of water in your house, and used to water plants. The form of Lord Ganesha is half elephant and half human and Sri Ganesha is said to embody all the of qualities of the elephant – his strength and his gentleness. He perfectly symbolises the coexistence of humans and elephants. However, in reality, while the traditional worship of Ganesha continues and grows, wild elephant populations in our country are suffering tremendously. This year we bring you an additional element to add meaning and love to your Ganesh celebrations. Send your blessings to the wild elephant populations by helping us raise funds to support elephant conservation work. Elephants are the longest living and largest land mammal on the earth today. Because of their large body size and long life span, fully grown adult elephants do not have natural competitors except for man. Man and elephant co-existence dates back to over 4000 years ago when elephants were integrated into cultural, religious and social lives of humans. Elephants require large areas for food and shelter. 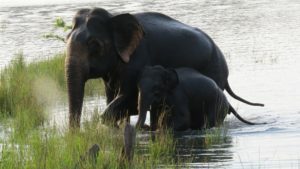 However, with increasing human influences in forest areas, the elephants are left with little choice but to come near human habitations and feed on luscious crops on the forest boundary causing serious social and economic damage to the farmers in the region. In such areas, local farmers perceive elephants as their enemy and want to get rid of them. Since 2010, Wildlife Research and Conservation Society (WRCS) is implementing community-based conflict management approach in North Kanara District in Karnataka wherein local farmers are trained in using simple and low cost crop protection methods. Till date, over 400 farmers are using the methods to protect their crops from elephants. Alongside, they are also training the local women in making elephant-themed handicraft items. WRCS is helping in marketing the products and the proceeds of the sale are directed to the women’s groups. Through this initiative, local communities are able to generate income through elephants and have begun to view elephants as a friend and not as an enemy. This positive image makeover of elephants is proving to be most useful in securing their future in human-dominated areas. The money you donate will be received directly by WRCS and will be used by them to help the projects they have begun in North Kanara. Your blessings will help human and elephant communities coexist.